Steve Bannon, the former White House adviser who was expelled by President Donald Trump for leaking confidential information and self-promotion, will be the special guest of Jair Bolsonaro for an official dinner on Monday, the eve of the Brazilian President’s meeting with Trump at the White House. Bannon, who has advised Bolsonaro’s son, Eduardo, will be among a group of right-wing guests joining Bolsonaro at his table for the exclusive event at the Brazilian ambassador’s residence. Bolsonaro will be in Washington next week where he will meet with Trump in the Oval Office. Their discussions will include trade, transnational crime and restoring democracy in Venezuela. Bolsonaro has made no secret of his desire to establish close ties with the United States. White House National Security Advisor John Bolton and other Trump officials have raised the possibility of a free trade agreement between the two nations. Steve had very little to do with our historic victory… Steve doesn’t represent my base—he’s only in it for himself. Bolsonaro should put himself in Trump’s shoes. Would he find respectful if Trump, in an official trip to Brazil to meet him, he first met a man fired by Bolsonaro for leaking confidential information and self-promotion? 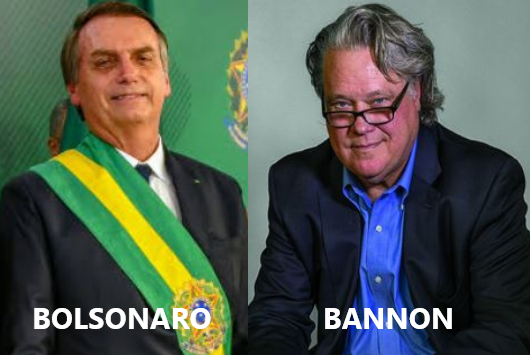 According to Veja, the exclusive event of Bolsonaro for Bannon will happen under the influence of Brazilian astrologer Olavo de Carvalho, who has been a self-exiled immigrant in the U.S. for 15 years, and Eduardo Bolsonaro. As part of his effort to expand his movement and laying a strategic groundwork for Bolsonaro’s U.S. visit, Bannon is propelling up Carvalho by officially inviting people to a hotel in Washington DC, on March 16, for the screening of Carvalho’s movie, which has several New Age characteristics. His movie was officially launched in the United States in 2017, but there was no American public willing to watch it. Bolsonaro’s meeting with Bannon is not only uncomfortable for Trump, who had troubles and conflicts with Bannon. It is also uncomfortable for Brazilian evangelicals, who had massive influence on Bolsonaro’s victory, but now they have just to observe Bolsonaro giving opportunities and space for Carvalho and his “nominations” — at the expense of evangelicals. Now will they have to observe also Bannon getting also space for such privileges — again, at the expense of evangelicals? It remains to be seen what Trump and evangelical leaders will think about Carvalho and Bannon, two adherents of a Islamic occultist, getting exclusivity from Bolsonaro. With information from McClatchyDC, PR Newswire and Veja.